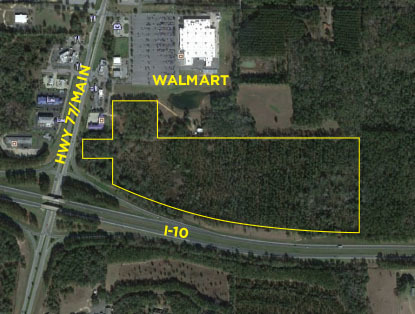 Seize this Incredible Opportunity to own this high exposure 59.6 Acre Commercial Parcel with 1550' of frontage on Interstate 10 in Chipley, FL. Easy Access with its location on Exit 120, with additional frontage on Main St (Hwy 77) overlooking Wal-Mart. Click on the External Links Tab for easy viewing of Tax Records and Zoomable Google Earth Aerials. Click on the Documents Tab to View Prior Appraisal and Development Plan. Call us 850-269-7653 to register for bidding! To register to bid, you will need to call us for instructions 850-269-7653. The winning bidder will sign a non-contingent contract and be required to place a bid deposit equal to 10% of the bid amount, to be sent by overnight mail on the first business day following the Auction. A personal check for this amount is acceptable. The check will be payable to your Escrow Agent, McNeese Title (see address and phone # below). You will mail the check to the National Real Estate Auction Group, PO Box 6334, Miramar Beach, FL 32550 for our delivery to McNeese Title. The Seller will have up to 3 days to accept or deny the bid. Buyers will pay all closing costs. 2015 Real Estate Taxes shall be prorated to the day of closing. The property will be purchased free of all liens and encumbrances of record. You will receive an insurable marketable title from McNeese Title. A buyer’s premium of ten percent (10%) will be added to the high bid to determine the total price to be paid. The closing shall take place no later than thirty (30) days after the auction at the offices of McNeese Title, LLC, at 36468 Emerald Coast Pkwy, Destin, FL, Phone: (850) 337-4242. You must bring either a Cashier’s Check or wired funds at closing. No purchase shall be contingent on financing, inspections or any other contingencies. Arrangements for closing through the mail can be made. All licensed real estate brokers are encouraged to participate by registering your buyers to the auction. NREAG will be happy to pay a commission to the Florida licensed and qualified broker whose properly registered buyer is the successful bidder at the auction and closes on the sale. Brokers must register their prospective buyer on the required Broker Participation Form (completely filled out, signed and notarized). The form may be obtained by calling or by visiting our website at www.nreag.com. This form must be submitted to the NATIONAL REAL ESTATE AUCTION GROUP no later than 24 hours prior to the Auction.